It’s a familiar ritual of flying, that moment when you’re buckled into your seat and the cabin’s loudspeakers come to life with a voice that says, “Hello, this is your captain speaking. Welcome aboard.” But how many times in your travels has that voice belonged to a woman? 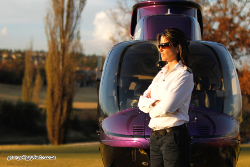 Hayley Pritchard, pilot for the Tintswalo Property Group, always knew she wanted to fly but that didn’t necessarily mean she saw it as a career. Pritchard has been flying commercially for the last six years and says that the best part of her job is that it takes her to places that she wouldn’t ordinarily choose to go herself. The only downside she will admit is spending so much time away from her family, but Pritchard certainly makes up for lost time when she has some spare time on her hands, citing spending time with family and friends as well as going to the gym, reading and shopping as some of her favourite past times. Even though Pritchard loves what she does, she knows it’s not a typical career choice for women but would really like to see that change. “Even though it is male dominated industry one can’t expect any special favours by being a woman. We really need to make the extra effort as it will ensure that women are treated as an equal. That being said, this is a definitely a career that you can excel at and I would love to see more women choosing to become pilots in the future – having your heads in the clouds is definitely not a bad thing,” she concludes.